You can win everything in that picture above! 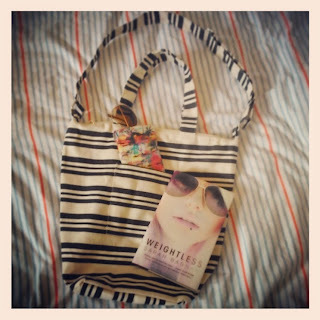 A hardback copy of Weightless by Sarah Bannan, a pair of sun-glasses and a sun-glass case, and a stripy canvas beach bag. How awesome? This give-away is UK only as it's gonna be a pretty heavy parcel. Any bonkbuster, usually the newest ones. 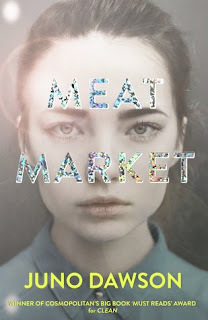 Love reading a new Tasmina Perry, or Victoria Fox on the beach. I like thrillers but on holidays I like a good old romcom! I quite like books like 'Around the World in 10 1/2 Chapters' by Julian Barnes, or authors like Bill Bryson, Joseph Heller as it's nice to have a few giggles in the sun - otherwise I sometimes opt for history books or historical fiction. I like inspirational 'life lesson' books on holiday both fiction and non-fiction. I prefer chic lit for beach reads. It varies, last beach read was The Time of My Life: Patrick Swayze, Lisa Niemi Swayze. Anything light and will make me smile. So basically chick lit! I love any horror books!